Disclosure: I was invited to a Tweet Up event at Cartoon Cuts. My family and I received free haircuts during the event. The opinions expressed are my own. It’s been a very long time since we went to Cartoon Cuts. That used to be our regular place for children’s haircuts when the boys were younger, they both had their first haircuts there. But with the demands of our crazy lives and limited time, we began visiting the barber shop just down the street instead. Last week, we were invited to Cartoon Cuts for a local blogger Tweet Up, and I was so happy to visit again. I had forgotten how much I love this place! Cartoons Cuts offers kids (and moms too, but more on that later) great haircuts in a kid-friendly environment. Each hairdresser’s station has a TV with a direct feed from their multi-player DVD player, so kids can watch their favorite animated movie or TV show while they wait for their hair to be cut. Children can also spend time in the play area, playing as they wait for their siblings to be finished. The stylists at Cartoon Cuts cut your child’s hair with patience and care, and they engage with them too! It was a great treat to have Lili, the stylist who cut Matty’s hair, attend to us. She gave Brandon his very first haircut over a decade ago! She remembered us, and asked him and Matty what grades they would be starting and complimented them on how handsome they are and how much they’ve grown, all while giving them a great new cut. 6 For 5: Pay for 5 haircuts in advance and receive one for free! Locks of Love: Donate 10″ or more of your hair, and you will receive a free haircut, any Tuesday through Thursday. Cheaper by the Dozen: A loyalty program that rewards customers by giving them their 12th haircut free! I didn’t plan on getting a haircut too, but I was due for a trim. My fellow blogging moms were doing it, so why not join them? Stylist Juanita did a great job giving me that cut that I wanted. 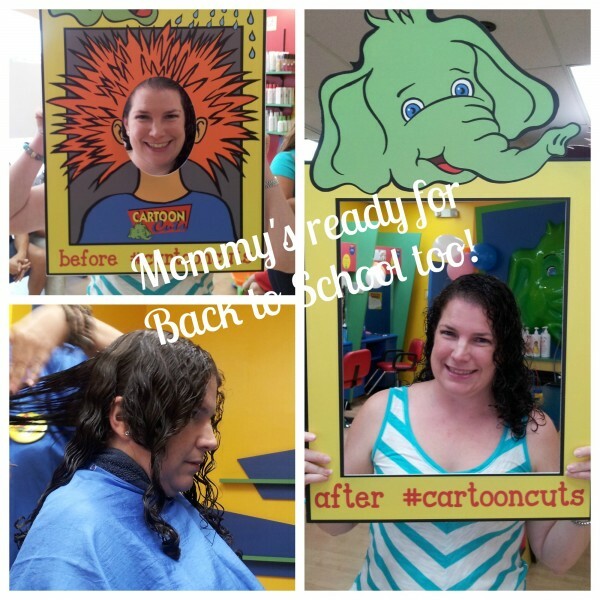 Head over to Cartoon Cuts and get your kids ready for Back to School in style!